I thought I would write this post as I could do with this type of advice myself right now. I can say with a lot of conviction that I don't think I have ever experienced the type of every day stress I have in my life like I do now. I have been through a fair bit in my (almost 26) years, but just lately I seem to be perma stressed on the daily, and I need to tackle it because it's affecting those around me in a negative way. I've had some time to think about what it is that stressed me out, and no doubt about it, my current job is the catalyst to my blood pressure raising. It's the most exciting, yet stressful job I have ever had. Part of this stress comes from the pressure I put on myself, but also the amount of time and effort I am putting in. I don't just want to be good at what I do, I want to be the best. I want to build myself a solid career and that means an awful lot to me, and when things mean so much to you, inevitably you can get stressed about them from time to time. Too add to that I stress about the usual stuff, money, paying bills, finding time to fit in social arrangements, being in a new(ish) relationship, pleasing people whilst trying to please myself (this is almost impossible) and my weight & health! That there at the end is a biggie!! So with all this on my "plate" if you will, and me stomping round like a bear with a sore head I have decided I have to do something about it. 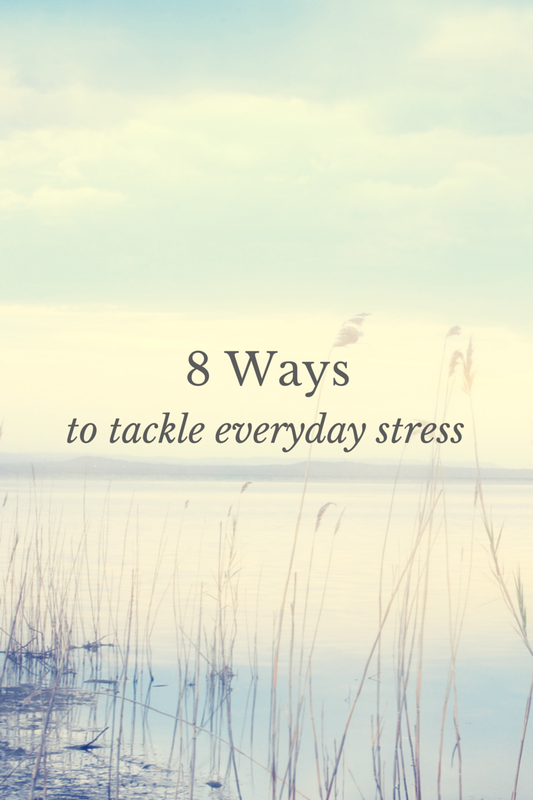 Which leads me on to listing 8 ways to tackle everyday stress and I'm actively working on these myself. It's an obvious one but I am the worst for doing before I think. I shout, I react, I cry when actually I haven't given myself 5 minutes to digest the situation. The old saying is right, you need to look after number one, and that number one is you. At the end of the day it's nice to please other people, but if its making you miserable that not going to help at all. Really come to the understanding that sometimes you are going to piss people off, but that's just life, don't let it stress you out and let go! When your stressed the last thing you want to hear is anything along the lines of "oh it's just work" or "There's so much else to worry about". It doesnt matter if it is the smallest issue in the world, if it's stressing you out you need a way to deal with it. When things seem like a little too much, try and find the good in a bad situation, put you sensible head on and work out how you can make the best of a bad situation. Sometimes a problem shared really is a problem halved. Speak to someone about what you have on your plate. Someone you know will just listen without having to give their 2 pence. Sometimes just doing this can help, even if it is just in a tiny way. To add to this, if someone in specific is stressing you out, talk to them about it. don't sit their harbouring these feeling, have a conversation about it. Obviously do it in a sensitive way but vocalise your issues and in an ideal world, move on. It may not be comfortable at first but trust me, you'll be glad you did in the end. Ironic I know as you will be reading this on-line, but make a concious decision to go offline. So much of what can stress us out happens through using technology. Needing to reply to a text, worrying when you don't that that person will get pissy with you. Checking your work emails when you should be on your day off, instead make the decision that when you walk out of work at the end of the day your going to leave the stress behind, compartmentalise your life. Your stresses in work shouldn't interfere and unbalance your personal life. Setting goals is all well and good, but if you don't achieve something the way you had hoped, in my case weight loss, change the goal posts rather than stressing. Sometimes things get in the way, distractions happen, but let life unfold exactly as it should without expecting too much from yourself and also those around you. Listen to music, soak in a hot bath and exchange your stresses for bubbles. You don't have to be sensible Sally all the time. Sometimes the best way to deal with stress is dancing to your favourite song on your own in your room, messing around with loved ones and being a bit childish. Whatever it is, just let go, give yourself half a day to do exactly as you please. Life can be bloody hard work but what I need to do is make sure my stresses stop interfering with my personal life. I need to be a bit more reflective and actively work on managing the things that are stressing me out. What do you do to manage a stressful life?